Graduate student Joshua Casara at work in the Scheibner lab. 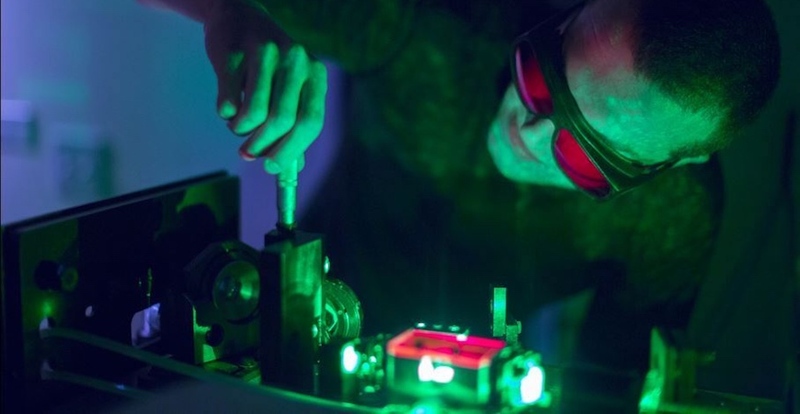 National security and a beautifully resonant violin have found a surprising link — a classic experiment in acoustics, recently replicated at the quantum scale as part of a collaborative project on quantum-enhanced motion sensing. UC Merced Professor Michael Scheibner and U.S. Naval Research Laboratory scientist Samuel Carter’s discovery — the cover story in a recent issue of Applied Physics Letters — may one day lead to technologies that help uncover hidden nuclear threats. Physical objects can be made to resonate at particular frequencies depending on the size, shape and material from which they’re constructed. But visualizing an object’s acoustic properties wasn’t possible until the late 18th century, when physicist Ernst Chladni devised a pioneering experiment that bridged the gap between sight and sound. The Chladni plate experiment was an ingeniously simple way to visualize resonance. Placing a thin layer of sand on a metal plate, Chladni drew a violin bow along the plate’s edge to produce vibrations. As the plate resonated, the sand on the plate’s surface was sent scuttling, until it finally came to rest in striking geometric patterns. The sand wasn’t settling just anywhere. It was collecting at nodes, points on the plate’s surface that remain still while the rest of the plate vibrates. The sand was forming patterns that were essentially visual representations of sound waves traveling through the solid surface. Chladni's plate experiment provides a way to visualize resonance. Video courtesy of Harvard Natural Sciences Lecture Demonstrations. Chladni’s experiment provided crucial insight into the acoustic properties of various materials. To this day, a modified version of his technique is still used in the design and construction of instruments like violins and pianos. In the novel quantum-scale analog of Chladni’s classic experiment, crystal membranes, quantum dots and focused lasers replace metal plates, sand and violin bows. 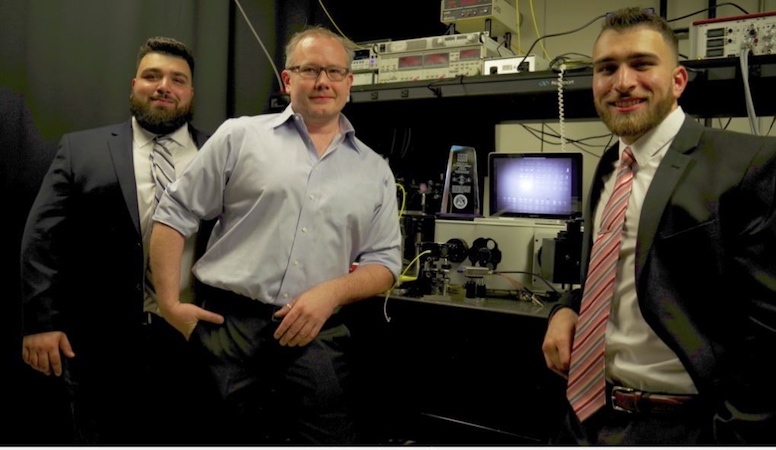 The researchers found that lasers could make these crystal membranes vibrate just enough to squeeze and stretch the embedded quantum dots, causing them to emit light at frequencies shifted by an amount linked to the vibration of the membrane. In this quantum version of Chladni’s experiment, the crystal membrane behaves like the resonating plate, the laser plays the role of violin bow, and the quantum dots function like sand, providing visual information in response to vibrations. More than just an update on an old classic, the discovery could lead to quantum dot gravity gradiometers — devices that measure changes in gravity — with direct applications to national security. Nuclear contraband is often transported in containers constructed from heavy materials that prevent the release of detectable radiation. But these radiation shields are so dense, they produce small changes in local gravity. Like the violin bow or the laser, these gravitational fluctuations could modify vibrations in quantum dot gradiometers, causing them to emit light to signal the presence of suspicious cargo. National security applications are why much of the work was carried out at the Naval Research Laboratory. Study coauthor Cyprian Czarnocki, who recently graduated from UC Merced with a Ph.D. from Scheibner’s group, worked directly with Carter on this project during a summer internship at NRL. It’s just one of many summer internship opportunities that Scheibner provides his graduate students. Professor Michael Scheibner (center) with UC Merced students Michael Simon (right) and Nickolas Simon (left) of Eirene Technologies. And thanks to the efforts of students working with UC Merced’s Venture Lab, this technology is being developed for commercialization. The work has attracted the attention of government agencies that oversee homeland security. Scheibner’s funding comes in part from a Defense Threat Reduction Agency grant. And Eirene Technologies CEO and current UC Merced student Michael Simon is working with other agencies who’ve expressed an interest in the technology. "We would certainly encourage continued development of this technology,” Mark Borkowski, Assistant Commissioner of the Office of Acquisition at U.S. Customs and Border Protection, wrote in a letter to Simon. “If successful, I believe it could be a candidate solution for future border security detection and identification requirements."